I am quite fond of pointing out poor service posture in this space and on my Twitter feed. 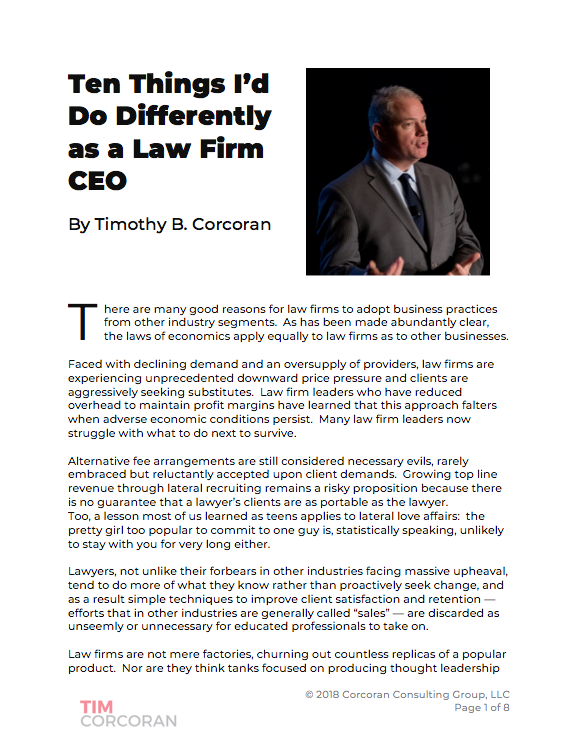 As an adviser to service businesses such as law firms and legal vendors, I've come to learn first-hand that a client-friendly service posture can help overcome objections to features and price. A lawyer who has a systematic approach to matter budgets and who communicates quickly when a matter is trending out of scope will engender loyalty from clients who care about predictability (Hint: ALL clients do). A vendor with a premium-priced offering that lacks needed features can still move units when its sales, implementation and support teams present a united front in putting client needs first. There are many business books that discuss customer service or client relations, but many of them fail to explain why this is good business. The connection is simple: customer loyalty generates repeat business, and repeat business lowers the cost of sales. Loyal customers generate leads through free referrals. Happy clients demand fewer discounts and write-downs. But even the most customer-focused organizations will stumble and make mistakes. It happens. A good service posture doesn't mean perfection, but it does mean the organization has a well-oiled process for addressing and correcting the situation. And loyal customers will forgive organizations when the mistakes are directly acknowledged and immediately addressed. Occasionally, however, organizations turn poor service posture into an art form, seemingly going out of their way to offend happy clients. Virgin Airlines is renowned for its excellent service posture, friendly staff, lavish perks and cheerful demeanor. As the following anecdote demonstrates, even the best organizations falter. By examining the missed opportunities, perhaps you can identify where your organization can improve its approach to client service. I scheduled a flight from Newark to London in business class, which Virgin Airlines labels Upper Class. Ooh la la. The airfare was, shall we say, about one quarter of my daughter's annual college tuition! But the need to hit the ground running on a Monday morning in London, going from plane to shower to business meetings within a couple hours, was critical and worth the expense. The week prior to the flight I was in North Carolina with my daughter at a soccer tournament and her team kept winning, and winning, and winning. As it turns out, we had to delay our flights home by a few days because her team made it into (and won!) the final match. I had planned for this contingency and had a very large suitcase containing a week's worth of soccer Dad clothes and a week's worth of business attire but alas the bag was far too large to fit into any overhead compartment. Upon arrival at the airport in North Carolina, I had to arrange for my checked bag to be switched at Newark from my return flight home on Continental to my London-bound flight on Virgin Atlantic. There was not enough time for me to retrieve the bag in Newark and then re-check in at Security but this connection, even though it consisted of two different reservations on two different airlines, is not atypical. Besides, Virgin and Continental had at the time a code-share relationship and they regularly move baggage between their respective flights. After 30 minutes, the Continental agent in North Carolina claimed to have achieved the proper routing and we were on our way. I made the connection in Newark later that evening to my London-bound flight and enjoyed the many fine amenities offered in the Virgin Upper Class cabin. Upon arrival, I was the third passenger to exit the plane and as I'm quite familiar with London's Heathrow airport I was able to make my way to and through Customs quickly to be the first passenger to arrive at the baggage carousel. I waited and waited as the bags were delivered. One by one every bag was retrieved until none remained, so I walked to the Virgin baggage service desk which was about 100 feet away. First, let's acknowledge the obvious fact that even in the best conditions sometimes bags get lost, or re-routed to Timbuktu. It happens if you travel enough, as I do. I complicated matters by asking an agent at a small airport to route my checked bag from one airline to another on two different reservations, and from a domestic flight to an international flight, and the window for making the connection was tight. So I wasn't exactly surprised when my bag didn't arrive, but I certainly expected an informed discussion. When greeting an unhappy customer, it's not helpful to start by insisting how wrong he is. I greeted the baggage agent warmly, advised that my bag didn't arrive and asked to open a claim. When I gave my name, she immediately claimed to have paged me at the baggage carousel and I had wasted time by not reporting earlier. I was a little taken aback and replied that I had arrived at the carousel at least 5 minutes before any other passengers and had waited there patiently the entire time and had not heard any announcement regarding any Virgin passenger, let alone a page for me. She insisted she paged me and that I must be mistaken. Now anything is possible, of course, and my hearing isn't what it used to be. But remember, I half expected my bag to be delayed in transit so I was tuned in and ready for such an announcement, and I pointed out that I waited at the carousel for 45 minutes and surely I couldn't have missed hearing my name multiple times. She insisted I was wrong and then stopped addressing me completely, turning to gaze at her screen instead. When you know there's a problem, advise the customer right away and begin to manage expectations. In less than a minute this surly agent transformed me from a calm and understanding passenger into an unhappy customer with an attitude. I asked the agent when they first became aware of the baggage mishap. She told me my bag never made it onto my flight from Newark. I was dumbfounded. I suggested that this fact could have been relayed to me when I boarded the Virgin flight in Newark. This fact could also have been relayed to me upon arrival in London. This fact could have been relayed to me by paging me a few times at Baggage Claim. And since the paging obviously didn't produce a result for 45 minutes, perhaps someone could have walked the 100 feet from the baggage desk to the baggage carousel to look for me. I shared my dissatisfaction in a much louder voice, for now I had lost 45 precious minutes which could have been used to trace my bag. I then asked if a claim had already been created, since obviously the airline had known 8 hours previously that my bag was not going to make it, and this particular agent had known for nearly an hour. Of course not. As the agent rightly reported, "I can't explain why no one else did their job. My job is to open a claim ticket." We then laboriously went through all the steps of providing my name and contact information, all of which was already readily available on my reservation, and we wasted another 10 minutes on data entry. It's helpful to put forth some effort in devising a solution. Or at least fake it. Once we completed the claim, I asked if anyone knew where my bag was and when it would arrive. It seemed silly that I should have to actually ask such a question, as it seems like the most obvious piece of information the agent should be prepared to proactively offer. Without looking at her screen she said "Since your flight arrived this morning, your bag will arrive tomorrow at the same time on tomorrow's corresponding flight." I was dumbfounded. I insisted that surely Virgin had to have at least one other aircraft traveling from the New York City area to London in the next 24 hours, but the agent insisted that that was the best they could do. This was the first of many times that this phrase would be used to dismiss my concerns. By now, the several other baggage agents were avoiding my gaze as all other passengers had departed. I refused to depart until a better solution was devised. A supervisor finally strolled over, looked at the agent's screen and said "Your bag is already en route to England on a different flight. It has to transfer from Manchester to London but it should be here later today." I stared a hole in the original agent's forehead, because she wouldn't look up at me, and I was even more furious. "Do you mean to tell me that this information has been on your screen this whole time but you were too lazy or incompetent to look at it, instead telling me in effect to go away and come back tomorrow? There's not even a line of passengers behind me waiting. What's your rush to get me out of here?" "It's now someone else's problem" doesn't count as doing your job. I left the airport and headed to London to buy some clothes so I could attend a business lunch. Less than 24 hours before I was on the sidelines of a soccer match in 98 degree weather (for my UK readers, that's a football match in 37 degree weather!) so I was still wearing shorts and a t-shirt and baseball cap... not typically how I travel but there was no time to change. Needless to say, it's hard to find suitable business attire on short notice so I spent the day uncomfortably under-dressed. Meanwhile, I dutifully called the airline's baggage status line regularly to learn when my bag would be ready for pickup. I've had bags lost before and in my experience it always takes less time for the bag to travel across the globe to the local airport and far more time for the bag to make it from the airport back to me. So I was prepared to expedite matters by going to pick it up on arrival. However, despite regular inquires from my London assistant and me, on both the phone line and the website, there was no updated status for the remainder of the day. On the rare occasion someone would actually speak to one of us, they would always claim that the bag is in transit and offer nothing further than "This is the best that we can do." Proactive outreach to unhappy customers will always go farther than ignoring them. I continued calling all day and into the evening, always asking two questions (a) when will my bag arrive at Heathrow, and (b) should I purchase more clothing for tomorrow? Absolutely no one would take ownership and by late in the evening I was resigned to the fact that I would not see my bag in time to dress for a day of business meetings. I escalated to supervisors on three different shifts and asked why no one would take responsibility for calling me every few hours, if only to avoid the hassle of my constant calls which tie up agents repeating the same issues over and over. One supervisor who was very friendly and actually sounded embarrassed by the actions of his colleagues said that it's simply not Virgin's policy to call anyone, even Upper Class passengers, and that all they can do is to respond to inbound inquiries. Each shift blamed the earlier shift for not providing more information and then described a nirvana in which the next shift would happily resolve the issue and return my bag to me. But no one could or would be more specific, repeating the mantra "We're doing the best that we can." At this rate, I could have taken a train to Manchester to retrieve my bag. Recognize when the system is broken and human intervention is needed. I called through the night and spoke several times to the Virgin Airlines baggage claim call center in India. I have no problem with this critical service function being outsourced overseas, except it presents a logistical problem in that no one at the call center can literally see the baggage like an agent at the airport can. So any caller quickly becomes aware that the agents are merely reading statuses from a screen and repeating scripted responses rather than actually going about finding a lost bag. I worked through two shifts of the Indian call center and each time they said they had sent a Telex to Heathrow to check on the whereabouts of the bag. At this point, the online system -- theirs and what I could see on the website -- gave no information. It was as if the bag had disappeared into thin air and no one knew where it had been since its last known location en route to Manchester. It pained me to point out that sending a Telex -- a Telex! -- to London is less efficient and effective than simply calling the Virgin agents at Heathrow. I offered to do this myself but there are no published phone numbers to reach an agent at Heathrow and no phone agent would reveal the secret numbers, even though several claimed to have called the airport while I was on hold. It was clear that there was no accountability in the system and no one could or would put forth the effort to go outside the rules and actually resolve the situation. It was always someone else's job to find the bag and update the status screen and all the rest of us could do was wait. There should always be an escalation path when resolving a problem takes too long. As the sun dawned on London and I was on the phone yet again with the Virgin call center in India, I suggested they call Heathrow to speak to a live person. The standard response was that because of time zones no one would be on site at Heathrow to take the call. After I pointed out that my flight had arrived at this time the day prior, and that the airport is a beehive of activity at this hour, one supervisor finally worked up the courage to call Heathrow. He then reported that one of the baggage agents would personally go search for my bag. I would bet a lot of money that it was my original friendly agent because nothing happened, literally nothing changed, for the remainder of the business day. There was no status update online, there was no call from any supervisor, even though at least one supervisor on each shift in multiple call centers had promised to personally monitor the situation. I was now resigned to the fact that I had to purchase all new business attire so I visited a shop early in the morning and acquired enough to see me through. I remain puzzled to this day why there was no process in place to highlight for Virgin line management that a baggage status had not been updated for over 24 hours. I remain puzzled why not once, not a single time, did I receive a phone call from anyone at Virgin about my lost bag. The only communication came when I called incessantly and harangued various agents to look further than their computer screen. Both the systems and the personnel failed, even though at every step along the way everyone could have reasonably claimed that they did everything their job description required them to do. Yet... no bag. Learning organizations embrace feedback loops. I arrived back in my hotel after a late business dinner on my second day in London and my bag was in my hotel room. There was no update from Virgin Airlines, no status update on the online system, no phone call, no email, no call to the hotel from the delivery service indicating a drop off time. The bag simply and mysteriously appeared with no explanation for where it had been or what it took to get it to me. For kicks, I checked the online status for a few more days and my bag was never listed as delivered and the ticket was never closed. I'm stunned to think that an organization priding itself on superior service didn't have alarm bells and urgent emails automatically generated from a lost bag claim that was multiple days old with no status update. The cynic in me imagines that there was a separate comment screen available only to Virgin personnel that said "This customer is a jerk and beyond help. Find and deliver the bag so we don't have to pay him, but otherwise don't engage." The business adviser in me wants to believe that management truly cares about abhorrent service, but the "system" lacks a feedback loop so there was no way to escalate the issue to the proper level, there was no way for any agent or supervisor to break protocol and take initiative and there was no automatic escalation for an open ticket that had aged beyond a certain time frame. Even more unsettling is that my status as Upper Class passenger was not a factor at all in Virgin's service posture, presumably because their service promise is limited to the on-aircraft product. Of course every customer should receive good service, but what sort of company doesn't go out of its way to address basic concerns for its highest paying customers? There are numerous lessons here for service organizations everywhere. I have no particular grudge against Virgin Airlines, although it might be instructive to point out that after a dozen Virgin flights in recent years I rejected Virgin, even as a lower cost choice, on a half dozen overseas trips last year (2013 update: I continue to refuse to fly Virgin) . A well-designed, well-executed service posture, with escalation paths and opportunities for human intervention, is essential in any business where customer loyalty is critical. Virgin Airline's cavalcade of errors and arrogance can serve as a learning opportunity. Mistakes happen. Some customers will overreact but many will remain calm until or unless you provoke them into an angry reaction. The more proactive your approach, the more likely the unhappy customer will remain calm and feel as if someone is taking ownership of the problem. And take ownership. The service posture might dictate that someone else is responsible for ultimately fulfilling the request, but picking up a phone to verify that this is underway, or following up with a phone call later to check progress will go a long way in demonstrating empathy. And don't confuse empathy with sympathy. At multiple points in the Virgin debacle the agents were evidently trained not to accept blame, which they translated as pushing the problem onto someone else. An unhappy customer has a right to his or her unhappiness and empathy can be as simple as saying "If I were in your shoes I'd be upset too, so let's see what I can do to help." Hearing that someone else is to blame doesn't help rectify the situation and probably makes it worse, because it suggests it's a known issue that the company doesn't care to correct. Managing expectations and proactive communication are inextricably linked. If you fail to set any expectation for the customer, he or she will most likely set their own expectation. If the problem will take two days to resolve, say it will take two days and then try to improve upon that time. Saying that a solution is "imminent" suggests minutes or hours, not days, and sets false expectations that are impossible to unwind. Tell customers what they need to hear so they can make proper arrangements, don't just default to telling them what you think they want to hear. And lose the "We're doing the best that we can" mantra unless you literally are putting forth the maximum effort conceivable. Since stating that "We're doing all that we think your problem deserves given our many other deadlines and priorities" isn't a customer-friendly stance, even if it's true, find some language a little less off-putting that reflects your concern.